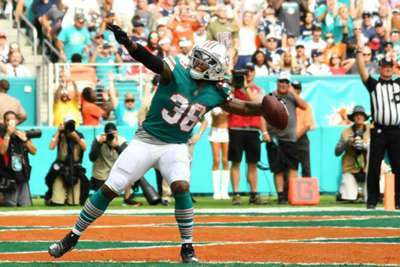 Miami Dolphins running back Kenyan Drake pleaded for the return of the game ball following Sunday's stunning win over the New England Patriots. Drake was elated after scoring the game-winning touchdown in a miraculous 34-33 NFL victory against the Patriots on Sunday. So much so, he chucked the game ball into the stands. Now, Drake is asking the lucky fan who caught it to return it. But do not worry, that person will not leave empty-handed. "We've got one last home game. If they don't have tickets already, I'll give them tickets to the game, whatever they need," Drake said. "I'd love to have the ball back. I don't regret throwing it, but now that I'm level-headed, I'm sitting down thinking about it, having the ball back would definitely mean a lot to me, and the team as well." Drake then took to Twitter, posting a video saying Sunday was "one of the most amazing moments" of his life. "I have a PSA," Drake continued. "I threw the ball in the stands and I would love to have it back. We can make a trade. I've got cleats, I've got gloves, I've got a jersey, I even got tickets. Please let me know." Drake ran 52 yards after receiving a lateral from wide receiver DeVante Parker, who got the ball from receiver Kenny Stills.